This was the last album that Ian Curtis listened too before he killed himself, it was found in his record player on the 18th of May 1980... two years before I was born to the day. And you can tell why he would have liked this, but it isn't bad enough to lead you to suicide. Suicide might lead you to suicide, but not The Idiot. The first thing you have to know about this album is that it was produced by David Bowie, and more than produced a lot of the music is vintage Bowie but then you throw Pop into the mix. And you have something that sounds like punk, but is much more refined and worked on, it sounds like a Berlin period Bowie album with a proto-punk touch. This makes it one of the founding albums of Post-Punk, there is the attitude which isn't as ridiculous as that of punk because Pop is older and he's been there and is just coming out of drugs now, thank you very much. But the voice is definitely there sounding somewhat like an angrier Lou Reed, with this Eno and Krautrock inspired music behind it. It's both different and similar to Bowie. The subjects are different and you can immediately tell that most of the songs were surely written by Pop while Bowie did the music. So it's great, and now that we have no more Bowie this will do nicely thank you. 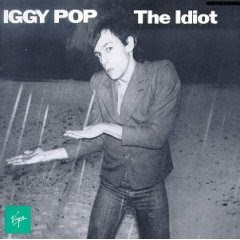 We will have more characteristic Iggy Pop music later, because no matter how good this album is it is as much a representation of Bowie as Iggy. "Nightclubbing" and "Funtime" appeared on the 1978 live set TV Eye, recorded during Pop's 1977 tour, the UK leg of which featured Bowie on keyboards and backing vocals. Bowie re-worked "Sister Midnight" (with new lyrics) as "Red Money" on his 1979 album Lodger, whilst his cover version of "China Girl" on 1983's Let's Dance became a huge hit. In 1980 Human League covered "Nightclubbing" in a medley with Gary Glitter's "Rock and Roll". The song was remade again the following year by Grace Jones as the title track to her album Nightclubbing. "Funtime" has been covered by Bauhaus’ Pete Murphy in 1988 and REM in 1995, amongst others.